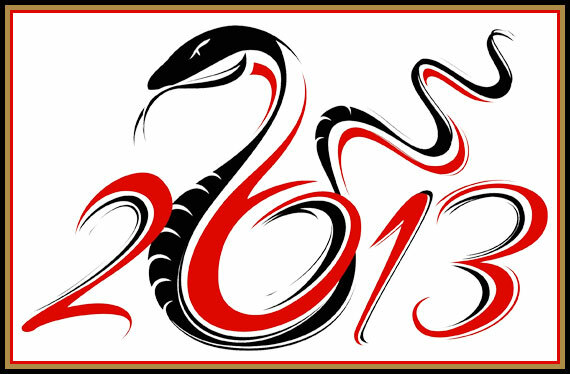 This year, the Chinese New Year falls on February 10 and 2013 is the year of the Snake! Do your children ever ask why the Chinese don’t celebrate the New Year at the same time we do? I love the opportunity to teach my children about how and why other cultures celebrate different traditions and the Chinese New Year is always a popular one with children. Who doesn’t love colorful costumes and amazing dancing dragons? One of the traditions that I would love for my family to adopt is to clean our home from top to bottom to thoroughly clear out any bad luck from the previous year and prepare our house to accept good luck for the coming year. Visit Kaboose.com for more information on the how and why of clearing your home to make way for the new! It is also the tradition on New Year’s Eve for the family to gather together to eat. They usually prepare eight or nine dishes because these are considered lucky numbers. Some of the traditional foods might include whole fish, whole chicken (with head and feet, they symbolize a proper beginning and end to the year), and dumplings shaped like gold nuggets or Chinese money. To celebrate with your family on Feb. 2, you might create your favorite Chinese dish at home. One piece of Chinese culture that most children love is learning about Chinese astrology and what animal corresponds to the year of their birth. After all the creatures finished the race, the order was finalized: rat, ox, tiger, rabbit, dragon, snake, horse, goat, monkey, rooster, dog, and pig.